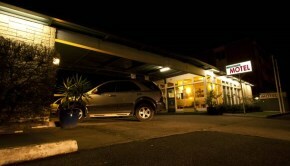 The Parkville Motel offers value without compromise in a location second to none. Our property overlooks Royal Park, part of the University/Zoo precinct on Melbourne's CBD edge. You can park the car at the door of your quiet, well appointed room, and walk to shops, cafes and bars. Or catch the tram to the city and in less than 10 minutes enjoy Melbourne's attractions. Each of Parkville Motel's ground floor rooms offer comfortable, clean, affordable accommodation in one of the most desired locations in Melbourne. All rooms are well appointed, toaster, fridge, flat screen TV, microwave and, of course, tea and coffee making facilities. Air conditioning and an iron and ironing board are standard. Rooms are serviced daily. We offer a range of accommodation solutions for up to 5 persons in a variety of bedding configurations. Studios have a queen bed with table and chairs, or a queen with a single, and family rooms feature a double bed with a bunk beds and a trundle bed. FREE WiFi internet to all rooms.